I'm sure I've blogged on this before. It's got to be somewhere in my archives, because it's the only real cleaning tip I have. You know those times when you're with a group of girls talking about girlie things like shoes and makeup and hair and poopy diapers and the best way to get permanent marker out of your couch? This is the only gold nugget I can pull out when it comes to household cleaning/organization. Oh, I will fill you in on shoes and hair 'til kingdom come, but that's about where it stops. We have an open door policy with friends. Come on over. Anytime. (You, too! You reading this. Anytime.) But whenever that doorbell rings, my mind immediately jumps to one place: the bathroom. Because, really, you can explain the rest of your house. People dropping my spur of the moment truly have grace... except when it comes to the bathroom. All else can be laughed away... legos on the floor, spills on the couch, shoes piled up on the stairs. But that little puddle by the toilet where your five year old didn't quite hit the target? That is a different matter. But, do I continue to worry about the state of everyone's favorite relaxing room? Of course not!!! That's because I keep everything I need UNDER THE SINK. (If you don't have a bathroom cabinet, use a pretty box or one of those cool storage cubbie thingies from Target.) Paper towels, toilet bowl cleaner/brush, disinfecting wipes, disinfecting spray, and the queen of all cleaners... Windex. When someone drops by and I'm unsure of the commode's condition I simply excuse myself for a moment. They think I'm "using the facilities," when I'm actually doing a quick wipe down of the porcelain. And remember, after you Windex the mirror, use the towel to give the faucet a good once over. Also, keep a few fresh hand towels under the sink so you can discreetly change out the one that has soccer-practice-mud and someone's scabby blood on it. Presto! If your guests use the bathroom they will think it's always this clean... and that's what Works For Me. 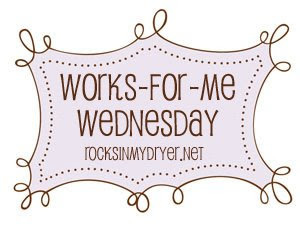 For more great tips check out Rocks In My Dryer. This is great. Love the helpers! VERY good suggestion. The bathroom is the one and only reason I panic when someone stops by unexpectedly. The toothpaste in the sink that the kids never wash down and the dirty hand towel drive me crazy when someone pops in. I pray they don't want to use the facilities. Thanks!! Awesome! Only problem is that I have a pedestal sink in the bathroom, so I need to come up with another clever way to take care of the hiding of the products! I love the idea though! I think I actually got this tip from your years ago. I love it and have wipey things under every sink! 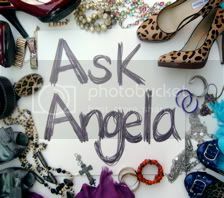 Thanks, Angela! Happy Pumpkin & Candy Day!